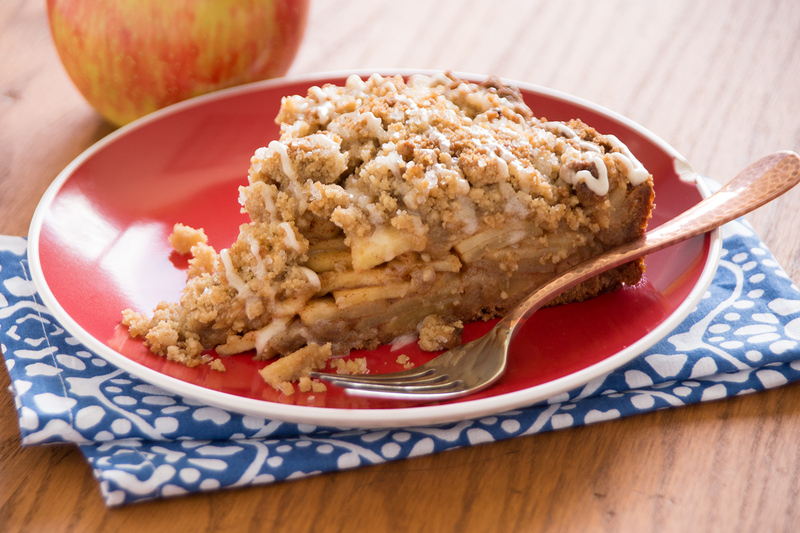 Cinnamon Rolls make a unique and tasty crust for this apple pie. Place 4 cinnamon rolls, next to each other, in the bottom of a sprayed 9 inch pie pan and press flat until they cover the bottom and start to go up the sides. Unroll the 5th roll and press it flat around the sides of the pan, covering as much of the sides as possible (this will be a little bit messy). Combine apples, sugar and cinnamon well. Pour the apples into the crust. Make the topping by combining the butter, flour and brown sugar until crumbly. Sprinkle over the apples. Sprinkle the coarse sugar over the top of the crumble, if desired. Bake at 375 degrees for 20 minutes. Cover with foil and bake another 30 minutes. Remove from oven, cool slightly and drizzle with frosting.